I loved the modern feel of the hotel. I was initially skeptical about sharing the bathrooms but it’s not at all inconvenient. I only ran into one person and it was an in and out thing. Since I’m traveling alone this was a great choice for me as the surrounding hotels were not as affordable. I do have to say that noises traveled and I could hear doors slamming and the sound of running water near by as I was trying to sleep. The rooms were clean but smaller than expected. The parking was secure. Where to find Framingham hotels near an airport? 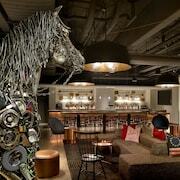 Where can I find hotels in Framingham that are near tourist attractions? If you are visiting Worcester and would like to book either an upscale or affordable place to lay your head in Framingham, you'll find that there is a range of accommodation possibilities with Expedia. You can choose from approximately 12 accommodations within a short driving distance of the heart of Framingham which are part of Expedia's extensive network. If you are seeking accommodation only a short stroll from the Framingham city center, Magnuson Hotel Framingham and Monticello Inn Framingham will be perfect. 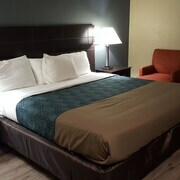 The Red Roof Inn Boston - Framingham is a budget-priced accommodation option. It is situated 4 kilometres (3 miles) from the heart of Framingham. 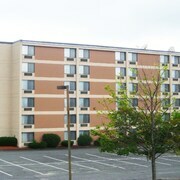 Visitors could also try the Econo Lodge Framingham. The Crescent Suites Hotel is 17 kilometres (11 miles) away from downtown Framingham. 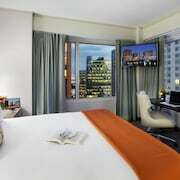 Another option is the Renaissance Boston Patriot Place Hotel, which can be found 25 kilometres (15 miles) away. 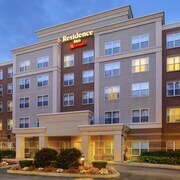 The Residence Inn Dedham as well as the Hotel Indigo Boston - Newton Riverside are two other accommodation options in Framingham. If you plan to experience more of the rural landscapes and rolling hills in this section of United States of America, you could plan to spend some extra time in other parts of Central Massachusetts. You could visit local attractions or enjoy skiing and hiking and then find a suitable place to stay. Looking for more to do? Spend the day visiting Goddard Rocket Launching Site and Auburn Mall, which you'll find in Auburn, 35 kilometres (22 miles) to the west of Framingham. If you'd like to stay in Auburn, be sure to check out the Fairfield Inn & Suites by Marriott Worcester Auburn and Hampton Inn Auburn. Or, you could consider staying in Marlborough, 13 kilometres (8 miles) to the northwest of Framingham, where you can pick from the Embassy Suites Boston/Marlborough and Courtyard by Marriott Boston Marlborough. Whether you're just passing through or staying in Marlborough, make sure you visit the Solomon Pond Mall and Spring Hill Cemetery. For travelers arriving or departing via Logan International Airport, you may plan to book a bed at The Ritz-Carlton, Boston, or Fifteen Beacon, both of which are a short taxi ride away. What are the most popular Framingham hotels? 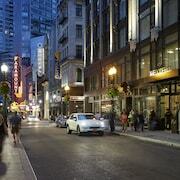 Are there hotels in other cities near Framingham? 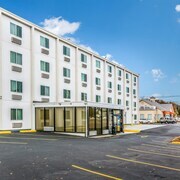 What other types of accommodations are available in Framingham? Explore Framingham with Expedia.ca’s Travel Guides to find the best flights, cars, holiday packages and more!